With tens of thousands of Syrian refugees amassing on Israeli and Jordanian borders, Israel transfers humanitarian aid, treats wounded. With tens of thousands of Syrian civilians fleeing a concerted effort by regime forces to defeat the rebels in southern Syria, Israel has offered humanitarian aid and medical treatment to some refugees massing on its northeastern border, even as the IDF maintains its official stance of neutrality in the ongoing civil war. 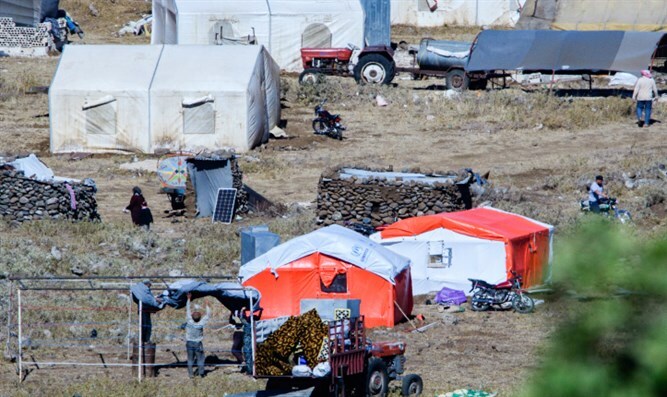 As efforts by the Assad regime to defeat rebel forces in the Daraa district in southern Syrian continue, more than 160,000 civilians are estimated to have fled their homes in the area, gathering along the Israeli and Jordanian borders. Jordan, which accepted hundreds of thousands of refugees prior to 2014, has maintained a closed border with Syria for the past four years. Last Tuesday, the Jordanian government said it would maintain the closed-border policy, and would not accept more refugees. Israel, too, has maintained a policy of not allowing Syrian nationals to cross the border en masse into Israeli territory. Prime Minister Binyamin Netanyahu on Sunday reiterated his government’s intention not to open the border in the Golan Heights to mass crossings. Over the past few days, however the Israeli army has transferred large quantities of humanitarian aid, including, food, medicine, clothing, blankets, and other goods to Syrian civilians gathering along the border. Israel has also continued its policy of accepting wounded Syrians for treatment in Israeli hospitals. The support Israel has provided for Syrian refugees has not gone unnoticed or unappreciated, one refugee claims, telling Yediot Ahronot that he and his fellow refugees view Israel’s actions as “very noble”. “We saw a very noble stance by the Israeli side, both by the aid that it sent and in its treating of the wounded,” the refugee, named Said, told Yediot. Said added that many Syrian refugees hoped that Israel would be able to convince other countries, including Jordan, to open their borders to those seeking asylum. Said contrasted Israel’s support of Syrian refugees with Jordan’s treatment of those gathered on its border. Assad’s forces have the backing of Russian military units deployed in Syria, despite intentionally targeting civilians, Said claimed.